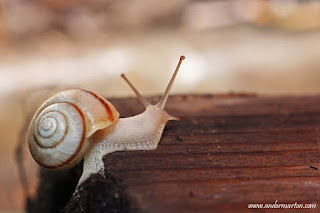 This is a new snail species what I saw for the first time in our garden. I made only a few pictures with it due the lack of time - I needed to catch the train back to Cluj, but I hope this weekend I will spot it again and I will able to make a reallz nice series with it. Thanks for the comment, you have two good macro photos . "More Liguus fasciatus in Gumbo Limbo Trail"
Great detail on the enlarged images Andor. A subject many would pass by, but you've captured him beautifully. Great shots! Like the top image the best. I have a down day and catching up on blog stuff. Have included you in my "buds" list. Blue Skies. The title said it all, nice and slow. Very nice shots. Congrats! ...the second shot is exquisite! He is really beautiful... I love his pale color. Beautiful composition with crisp details. 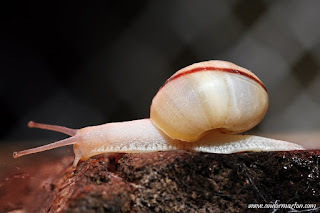 Very nice shots of a cool looking snail. Ma pricep putin la melci, dar nu imi amintesc sa fi vazut ceva asemanator. Frumoasa coloristica. Excellent Shots Andor the lighting on the snails is perfect well done ! !